The last thirty days have witnessed a spectacle as astounding, as momentous, as far reaching as any of the episodes that have shaken the Earth’s foundations and caused mankind to stop, look and listen. 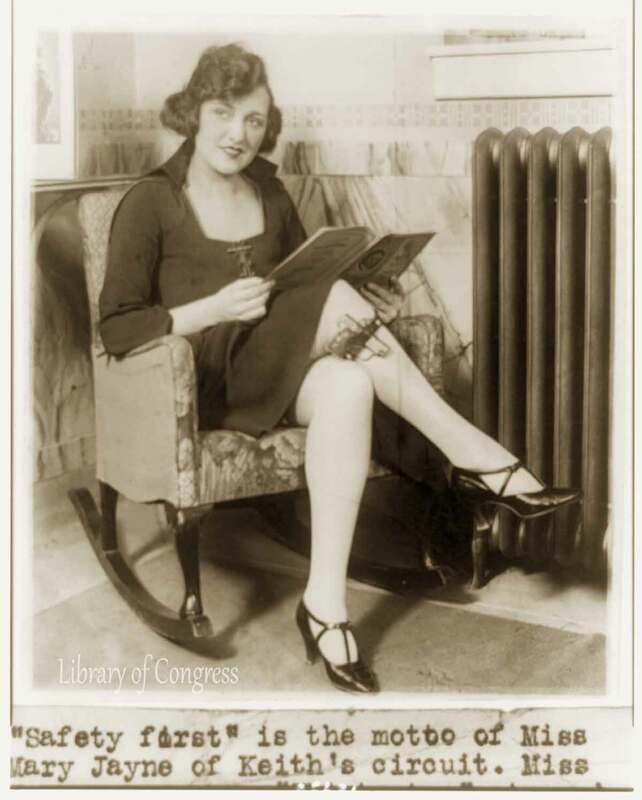 Mary Jayne seated in rocking chair with pistol strapped to her knee, claiming exemption from concealed weapon regulation by saying her thirty-two isn’t a concealed weapon in these days of knee-length skirts. A revolution has occurred of greater significance than the French revolution, the Russian revolution or perhaps even our own revolution of 1776. The flapper has rebelled – and by that act of rebellion have not only justified their existence but insured their survival. They have hurled the gauntlet in the face of Parisian dictator of style himself, Paul Poiret and declared that from now on they are going to use their own minds in matters of dress. We asked women for simple Yes or No answers to Short Skirts, Rolled stockings , Corsets, High heels, Bobbed Hair, Face Makeup. Read on to find out how they voted. Mr Paul Poiret has seen fit to take up the cudgels against the flapper, on behalf of the long skirt, and therefore he cannot object if the shafts of ridicule are hurled at him in return. We fear that is the very designers of senseless out-dated modes ( such as the esteemed Mr Poiret ) who will ultimately be consigned to the scrap heap of style. The flapper is now a Hollywood sensation. The Krazy Kat club in 1922. Sorry Mr Poiret, but you must look up from the side walk a little more as you stroll through Paris. The age of the short skirt is upon you! The age of the bobbed hairdo is upon you ! Twenty girls in Montreal have started a ” No Longer Skirt” league. All success to them. Their sisters in the US are not far behind them as The Flapper referendum shows. Of the scores of votes received as we now go to press: here are the results. Interestingly, there was overwhelming support for the new vogue for bobbed hair and makeup among all the women who answered our poll. So, Mr Poiret, it looks like your ship has been called home on this matter. The age of the flapper is upon you, we will see more of her legs, her face and her attitude !